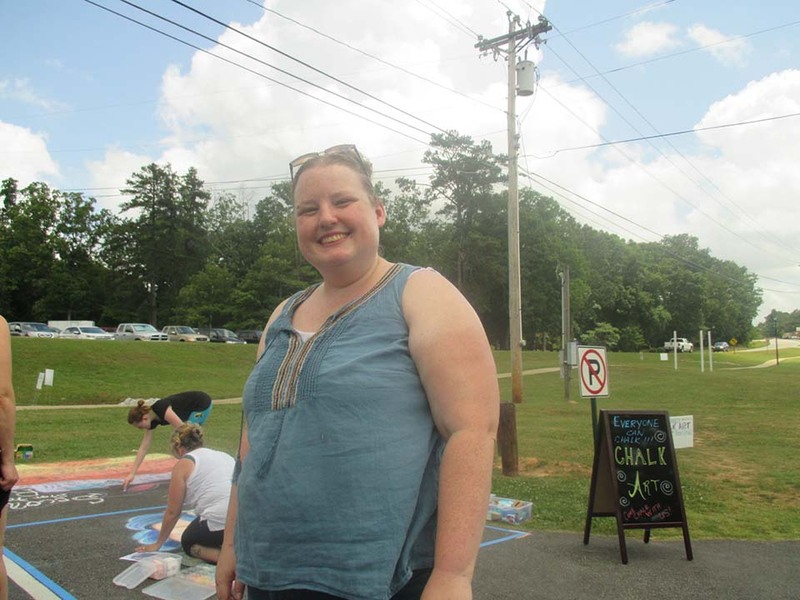 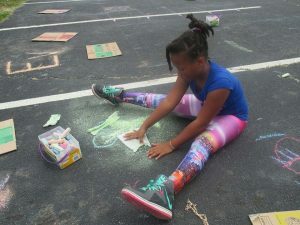 On May 20, 2017, the Fayette County Public Arts Committee and the town of Tyrone, GA hosted a chalk art event in conjunction with their first Shamrock Arts Festival. 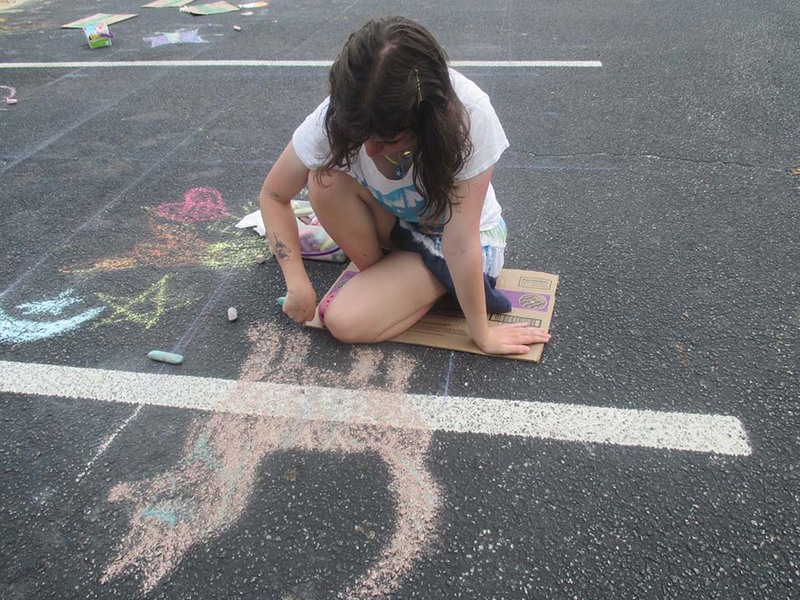 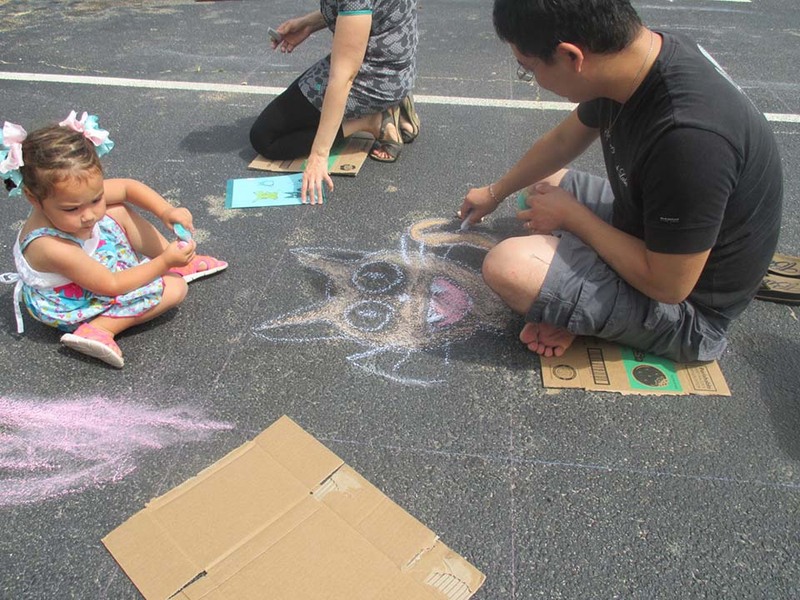 Approximately 20 artists came out to Shamrock Park to chalk in 8’x8′ squares. 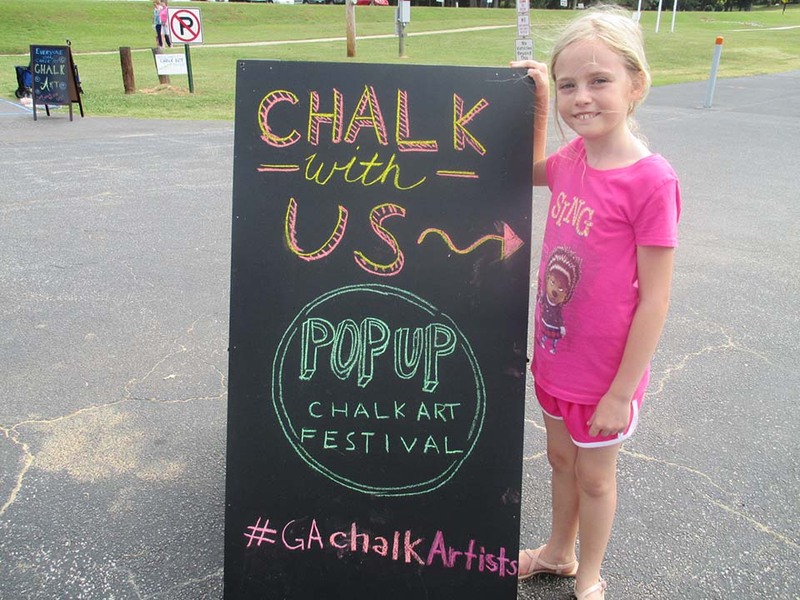 We also had an adjoining community space for our younger artists and walk-up chalkers. 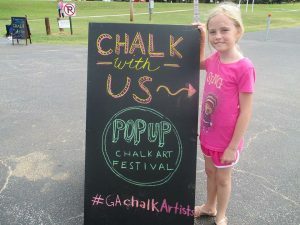 The morning was bright and beautiful; it was the perfect weather for chalking as we set up the tents, laid down grids, got out chalk, and prepared for a fun day. 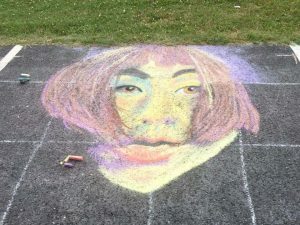 As a member of the Georgia Chalk Artists Guild, I had participated in a workshop given by The Chalk Guys on 3D chalk art techniques. 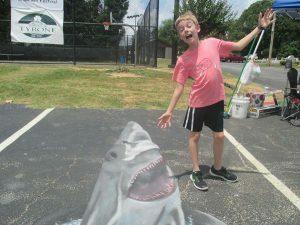 During the workshop we created a drawing of a great white shark, affectionately known as “Bruce” on tar paper, which I was able to bring to the event for people to have fun photographing. One of the things I enjoy most about chalk festivals is the sense of camaraderie and community. 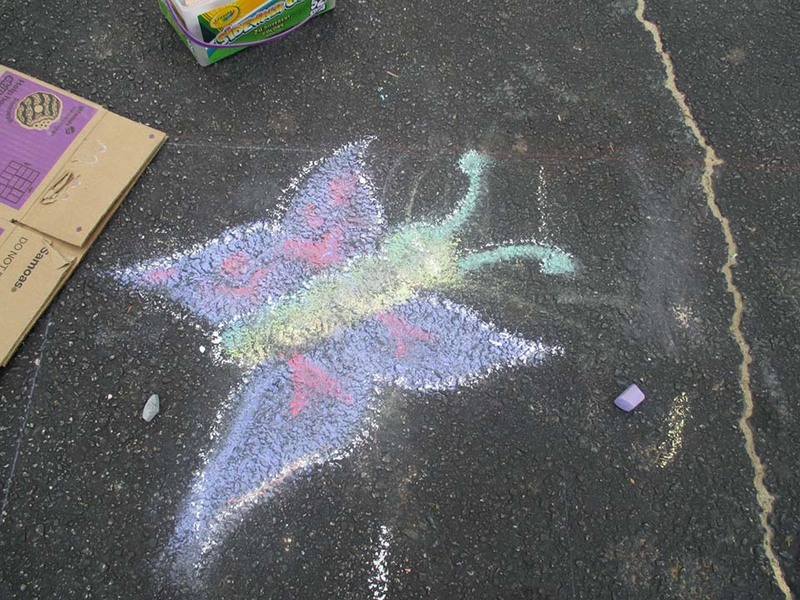 Chalk has a broad range appeal, I think. 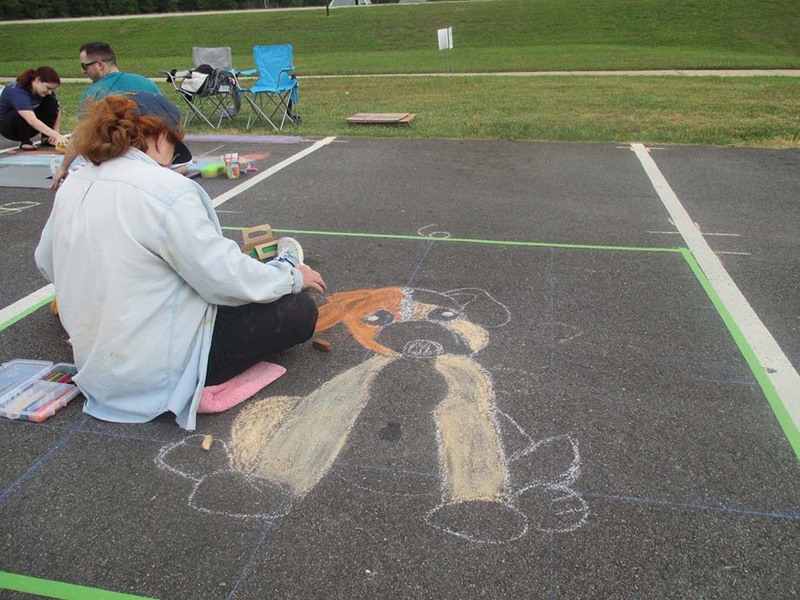 It engages artists of all ages and skill levels. Some people chalked for a few minutes, some chalked for hours. 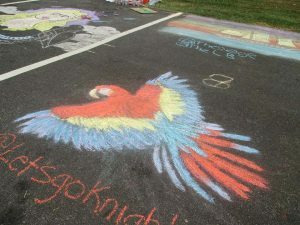 Some came with a plan and a design in mind, some created a unique work of art on the spot. 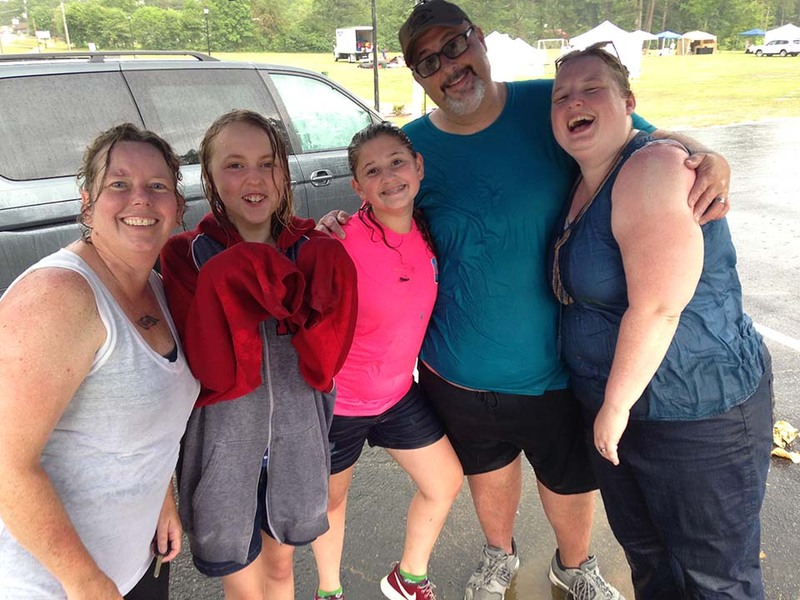 All of them enjoyed themselves thoroughly. The more I participate in these events, the more I realize that the engagement goes beyond the artists. There is a performance aspect to street art that also draws the audience into the creation. 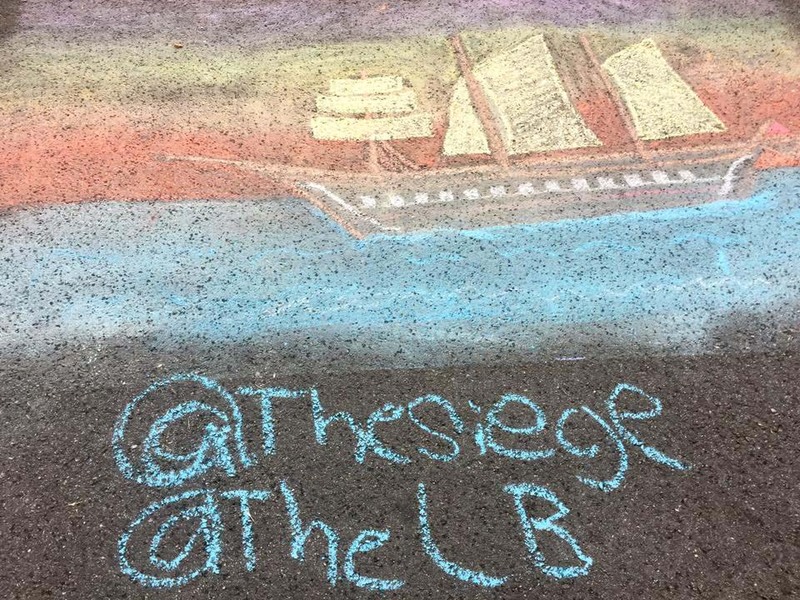 People are really surprised that ordinary chalk can be used to create artwork of such depth and detail, and yet, because it’s such a familiar medium it’s much less intimidating to pick up and give it a try. 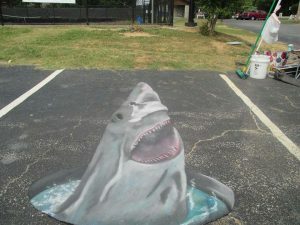 And a large number of people do try it, at least for a few minutes. 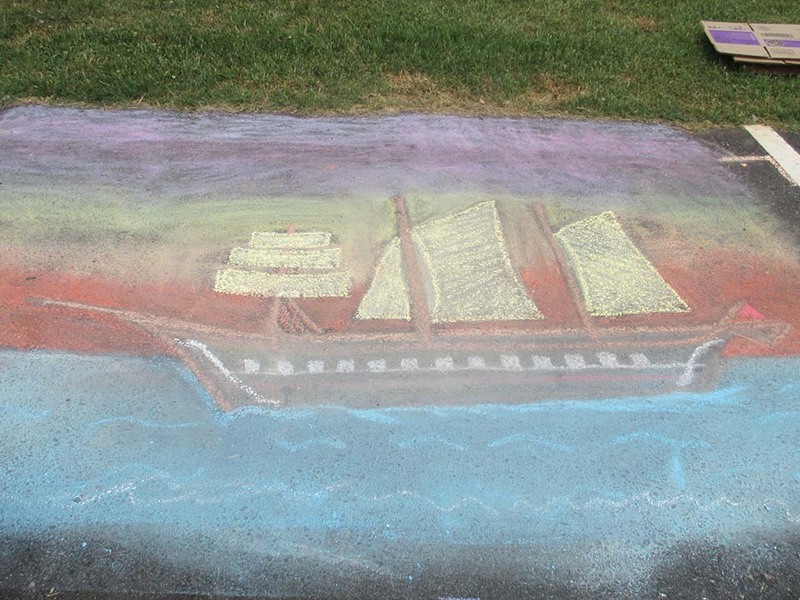 I have seen people who say “I can’t draw” pick up chalk and draw something amazing. 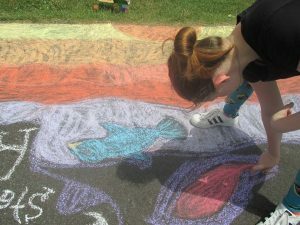 And this festival was no exception. 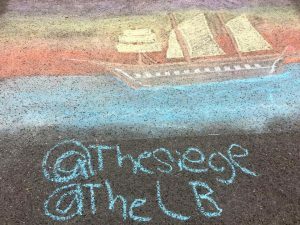 So, there we were creating art, talking to people, and generally having what would constitute the perfect chalk day when someone pointed at the big, dark thunderclouds rolling in just west of the park. 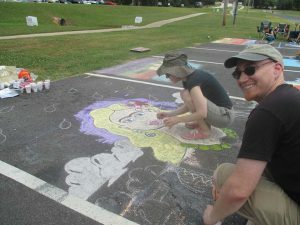 Some folks had finished and packed up already, our volunteers started gathering up the community square chalk and putting things under the tent. 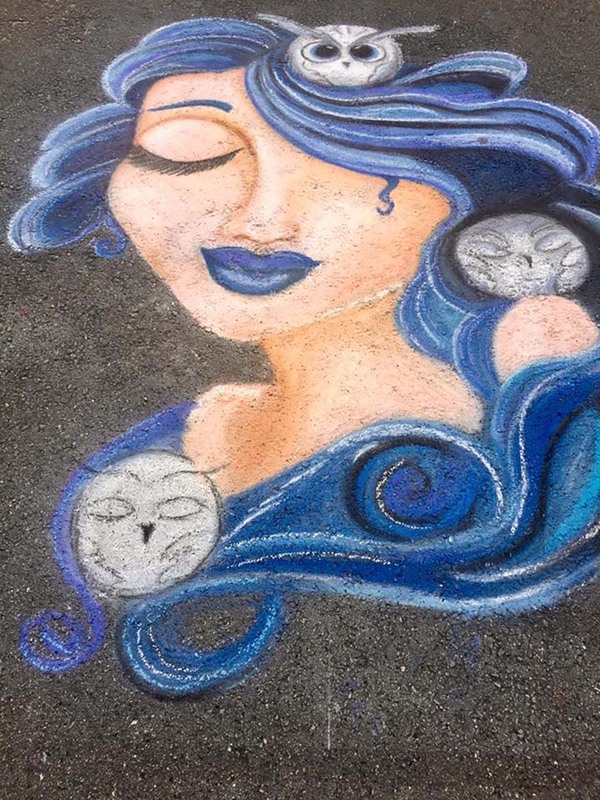 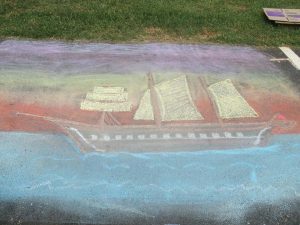 Chalk Art will be returning to the Second Annual Shamrock Arts Festival at Shamrock Park in Tyrone, GA on May 19, 2018. Everyone is welcome at this free, community event and we hope you’ll join us. 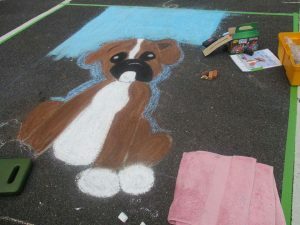 Let’s hope for no rain.